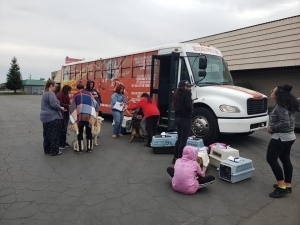 FRESNO, CA (KMJ) – The Rescue Express Van is saving unwanted animals throughout California, including the Central Valley. Post Christmas, it’s the time of year when animals are dumped at shelters. 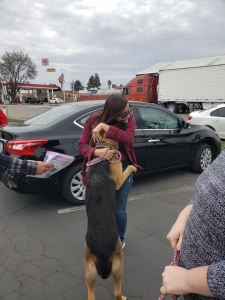 Fresno Humane Services alone reportedly took in 50 dogs on Wednesday, January 16. 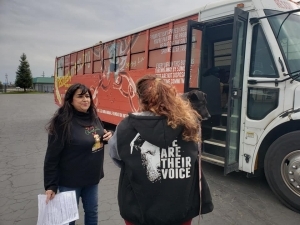 A group of rescuers based up and down California work to network animals and transport them to cities that have animal shortages. 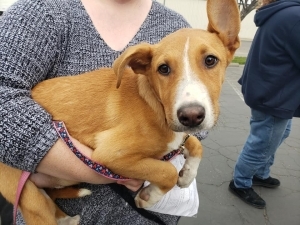 KMJ’s Liz Kern fostered two puppies over Christmas and News Year’s through Fowler Paw Prints, whose founder, Irene Altamirano Prieto, regularly rescues litters of unwanted puppies or dogs that need humans to remove them from desperate situations. Irene Altamirano Prieto, Kelly Guerra, KMJ’s Liz Kern, Joshua Bodhi Kern. 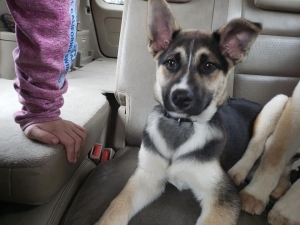 Liz Kern’s Foster Puppy “Blackie”, Husky-Shepherd Mix. 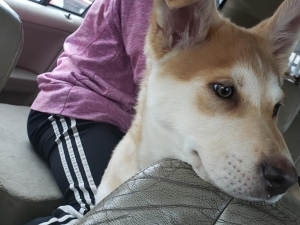 Liz Kern’s Foster Puppy “Bella”, Husky-Shepherd Mix. 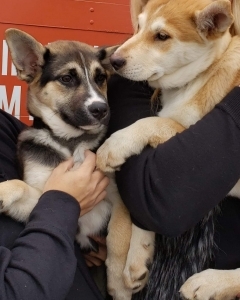 The Husky-Shephard mix female dogs, Bella and Blackie, would have ended up at the CCSPCA, where the shelter already has a high kill rate. It took in 22,100 animals from July of 2016 to June of 2017. In that time, 19 percent were adopted. Almost 1,400, or more than six percent, were transferred to other agencies. More than 13,000 animals or 60 percent were euthanized. 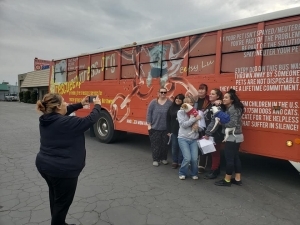 Kelly Guerra takes a photo of other rescuers and fosters at the drop-off location at Jensen & the 99 Freeway, in Southwest Fresno. 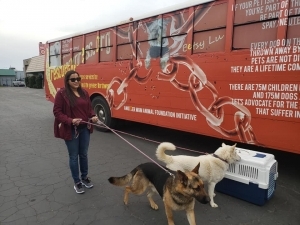 Rescuers, like Kelly Guerra, were gathered in a parking lot by Jensen and the 99 Freeway, sending the fostered animals north on a trip to re-home them. KMJ’s Liz Kern: What happens to them at the shelter? Kelly: Unfortunately, when they don’t have room, they euthanize them. Its very very sad. There’s just not enough room to hold them all. 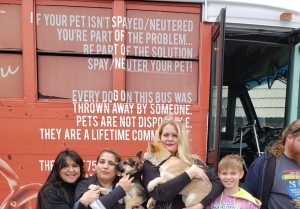 Fowler Paw Prints founder, Irene Altamirano Prieto, regularly rescues litters of unwanted puppies. The van was packed wall-to-wall, every inch filled with cages of animals that were about to get a second chance. 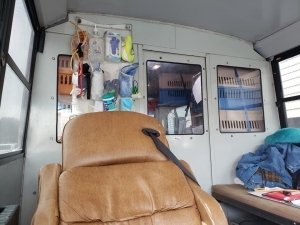 Driver Andrew from the San Diego-based non-profit Rescue Express drives north a couple times a month, picking up dogs and cats along the way. Andrew: We start in San Diego at about 4:30 in the morning, and them we drive up to Eugene and we get up there about 11:00pm. Liz: What are the dogs going to be doing up there? Andrew: Most of the time, they end up having families, so they go from the worst possible conditions in shelters an they get put in a home. January 5th was windy and cold as the animals waited in cages next to their fosters, for their turn to be loaded into the van, soon to go to Eugene, Oregon to Lucky Paws Rescue and others. Andrew is one of a couple of drivers. He’s a volunteer, just like the fosters. All are lifesavers. 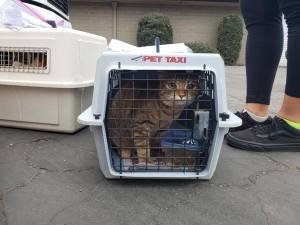 Andrew: Especially like Central Valley area, we have some of the highest kill shelters in the nation in this area, so rather than terminating a life, it’s better to take care of it. Liz: Are there any types of dogs that you see a lot of have a problem being adopted here? Andrew: A lot of small dogs – Chihuahuas. 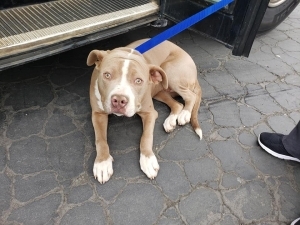 Pitbulls are also at high risk of being euthanized at shelters. Two were being dropped off on this run. The last dogs were loaded up, their screams sound pitiful, but these animals will live to see tomorrow. 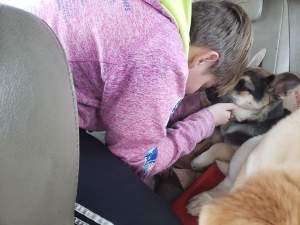 You can foster animals though Fowler Paws on Facebook or through Animal Compassion Team or any number of organizations affiliated with local shelters. Learn more about the transport click on RescueExpress.org. 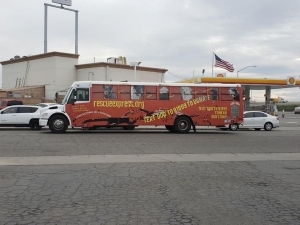 Safe & Humane Animal Transport: Rescue Express is a 501(c)3 nonprofit organization that saves thousands of lives each year by offering free animal transport for approved rescue partners. 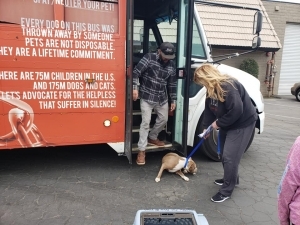 Each of our weekly transports bring hundreds of homeless animals from high-kill shelters and overpopulated areas in California to rescue partners in Oregon, Washington and Canada who work very hard to find them loving, forever homes. Our fleet includes 4 school buses that have been converted to safely & humanely transport 150 animals at a time. There is no greater calling for us and we work very hard to save as many animals as we can each year. We rely upon generous contributions from donors and supporters in order to offer our services at the lowest cost possible to our partners. Please consider joining our mission and saving lives by donating today.